As with all slings, chain slings shall be inspected before use. a. Excessive wear. If the wear on any portion of any link exceeds the allowable wear shown on this table remove from service. Use of a caliper is required to ensure proper measurement. 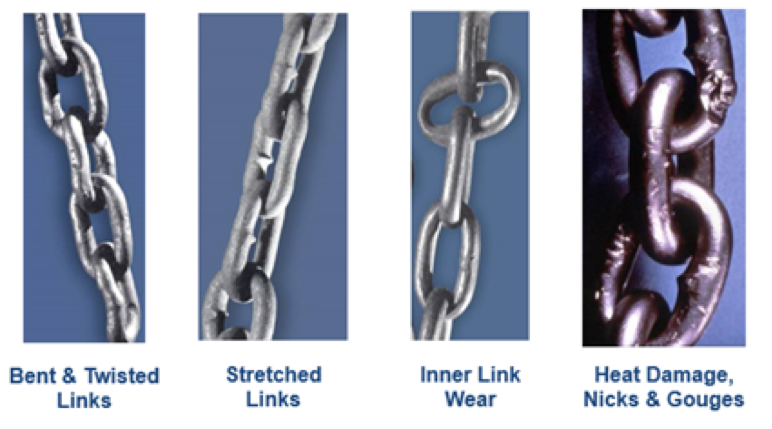 Chain wear is often visible near the hooks on heavy slings since they are often dragged around. b. Twisted, bent or cut links. c. Cracks in the weld area or any portion of the link. g. Any deformation or degradation of components. If hooks have been opened more than 5% of the normal throat openings (measured at the narrowest point) or twisted more than 10 degrees from the plane of unbent hook, the sling shall be removed from service. Any chain sling removed from service should be tagged and returned to the central issuing department with data covering the detected during the inspection. The sling can then be returned to an authorized repair service center for the appropriate repairs and proof testing.